Extreme weather events, such as droughts, strong winds and storms, flash floods and extreme heat and cold, are among the most destructive yet fascinating aspects of climate variability. Historical records and memories charting the impacts and responses to such events are a crucial component of any research that seeks to understand the nature of events that might take place in the future. Yet all such events need to be situated for their implications to be understood. 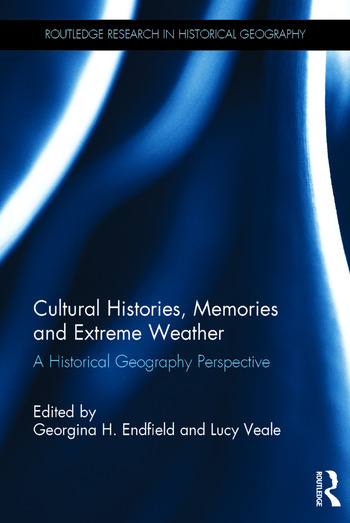 This book is the first to explore the cultural contingency of extreme and unusual weather events and the ways in which they are recalled, recorded or forgotten. It illustrates how geographical context, particular physical conditions, an area’s social and economic activities and embedded cultural knowledges and infrastructures all affect community experiences of and responses to unusual weather. Contributions refer to varied methods of remembering and recording weather and how these act to curate, recycle and transmit extreme events across generations and into the future. With international case studies, from both land and sea, the book explores how and why particular weather events become inscribed into the fabric of communities and contribute to community change in different historical and cultural contexts. This is valuable reading for students and researchers interested in historical and cultural geography, environmental anthropology and environmental studies. Georgina H. Endfield is Professor of Environmental History based at the University of Liverpool, UK. She is PI of an Arts and Humanities Research Council funded project exploring extreme weather events in UK history and is currently President of the International Commission for the History of Meteorology and Editor of The Anthropocene Review. Lucy Veale is a Research Associate at the School of Geography, University of Liverpool, where she is working on the history of extreme weather events in the UK. Lucy’s interests and expertise are in archival research in historical geography, and she has worked on a wide range of projects relating to environmental, landscape and climate history.